The amount of food that has been made in my kitchen in the past week is obscene. 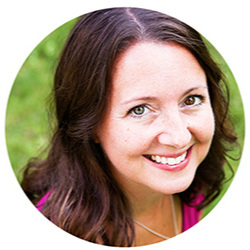 We're talking: tons of healthy lunches/breakfasts, 62 freezer meals (with the help of some awesome ladies - details to come on this soon! ), multiple slow cookers..
My little boys and I are wrapping up Spring Break week. While it has been wonderful on so many fronts, I am currently on overload and am secretly praying for a few moments of alone-time peace. Or for a cold margarita to fall from the sky. Nice weather is (mostly) here, and that makes me one happy girl. At this very moment I am working outside while my little boys run around and play "castle" in our bushes. I have longed for this moment for seven months and it is finally here! Pinch me! A really fresh, light, healthy side dish. Greek yogurt, cilantro and cucumber are just a few flavors that flash through this tasty nutty quinoa dish. Serve this colorful dish alongside a grilled spicy chicken breast or fish as a main meal! For Ebby's and my Bloggy Day last month, I wanted to make at least one thing that I wouldn't typically make. 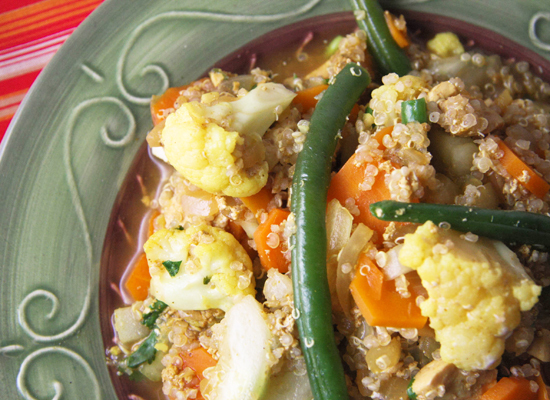 This recipe caught my eye because it is packed with foods I love, tons of veggies and quinoa. Curry, however, is hit or miss with me. With some dishes, I love it, and with others, it's just ok. This turned out to be a really fresh, light, healthy side dish. The Mozzarella-Olive Wedges and Western Potato Rounds, among many other bold-flavored foods we had floating around the kitchen that day, gave it some serious competition in the realm of flavor. Served with perhaps spicy chicken or fish as a main meal, however, it would be fantastic. If I made this again, I would add some spice. Perhaps a few diced jalapeno peppers. And this is just a personal thing, but I would add only half the curry the recipe calls for. How do you make quinoa? 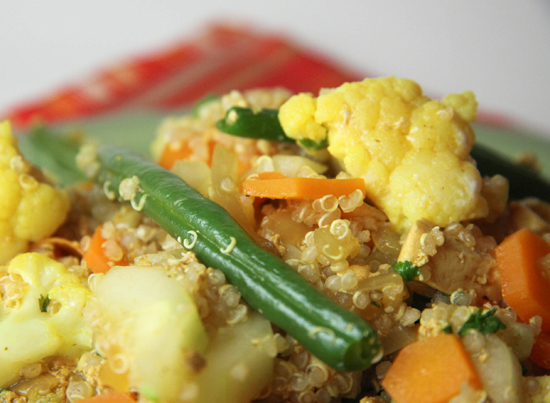 Quinoa cooks very similiar to rice. You prepare the rice in liquid with a 2:1 ratio of liquid to quinoa. Quinoa picks up the flavor of what you prepare it in, however it has a nice chewy nuttiness that helps it avoid becoming mushy. Can I prepare quinoa in something other than water? Yes, quinoa is easily prepared with a variety of liquids. There are many options but chicken or vegetable stock are popular as well as coconut milk which would make it more creamy. Are there different kinds of quinoa? Yes, there are many kinds of quinoa. The most common you will find in the stores are white, black and red quinoa. White quinoa is probably most used and cooks up most fluffy compared to its more colorful counterparts whereas the red quinoa has a richer taste and could be more chewy than the other colors. All would work well in this recipe! Bring a large pot of water to a boil. Add 1 cup of rinsed quinoa and cook for 6 minutes. Add the green beans and continue to cook for 4-5 minutes, or until green beans are crisp-tender and grains are tender but still slightly crunchy. Drain. Leave in colander. Dice a medium cucumber and gently pat it with a paper towel. Place in a small bowl and add salt to your liking. Toss and place in refrigerator. Heat 1 1/2 tablespoons of canola oil in the same skillet over medium-high heat. 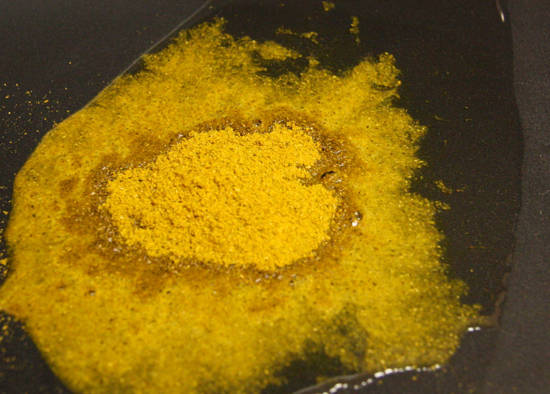 Add 1 1/2 tablespoons of mild curry powder, and cook for 30 seconds. Add the onion, garlic and ginger and stir-fry for 2 minutes. Add the cauliflower, carrots and tofu. Cook, stirring constantly, for 2 minutes. Add one 14.5-oz. can of vegetable broth and bring to a boil. Cover and reduce heat to medium-low. Simmer for 6 minutes, or until vegetables are crisp-tender. Fold in the quinoa-green-bean mixture. Serve with the cucumber salad (I mixed mine right in). A really fresh, light, healthy side dish. 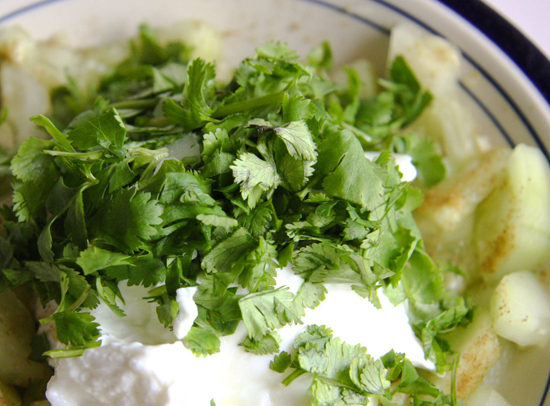 Toast cumin seeds in a large, deep nonstick skillet over low heat for 3 minutes, or until fragrant; transfer to a small bowl and add cucumber, ½ cup of the yogurt, and ¼ cup of the cilantro; toss and reserve.